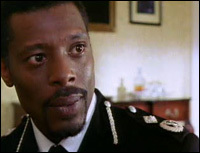 Originally conceived as part of a series of modern adaptations tackling contemporary issues, this version of Othello (2001) was commissioned as a single drama by ITV a few years after the London Metropolitan Police was accused of 'institutional racism' following an inquiry into the death of Stephen Lawrence. Moving the action from Cyprus to London, and imagining Othello in the role of the first black head of the Met, Andrew Davies' script is daring and provocative, touching on a range of contentious issues. There's enormous scope for using this modern interpretation of a classic tragedy in the Citizenship and English classrooms in particular. What have this month's teachers made of it? Don't forget to have a look at previous months' Show and Tell, which include two lyrical British Transport Films' productions, Terminus (1961) and Snow (1969), as well as Ridley Scott's first ever film (1965) Boy and Bicycle (1965).